Gov. Jerry Brown delivers his final State of the State speech. Photo by Max Whittaker for CALmatters. Brown, delivering his 16th such speech during an unprecedented four-term tenure as California governor, contrasted California with the direction the United States is heading under Republican President Donald Trump—touting the state’s efforts to combat climate change and its embrace of Obamacare. He reiterated his commitment to two major infrastructure projects he’s long championed: a high-speed train that would eventually connect Los Angeles and San Francisco, and a massive tunnel to move water from the north end of the state to the south. And he gave an impassioned plea for legislators to look at the big picture of California’s criminal justice system instead of passing new laws in response to crimes ripped from the headlines. Democrats praised Brown for an optimistic speech that demonstrated the hallmarks of his leadership. Even some Republicans offered mild praise: Assembly Republican Leader Brian Dahle called Brown “one of the most conservative Democrats in this place” for his relative prudence. But he criticized the governor for signing laws, like the gas tax, that raise the cost of living in California. What Brown didn’t mention: the fact that California has the highest poverty rate in the nation, that housing prices that have skyrocketed beyond affordability for many residents, and that the state’s tax structure exposes it to perpetual cycles of boom and bust. Also absent were the obscure intellectual references that have studded his past speeches—although he did contrast the state’s bloated penal code with the Biblical 10 Commandments. His also struck some themes that are vintage Jerry Brown. He cited California’s recent wildfires and mudslides and the Doomsday Clock, echoing past speeches in which he predicted environmental disaster. He advocated remedies to slow global warming—clean cars, renewable energy—that resembled ideas he espoused when he was first elected governor more than four decades ago. Yet as he looked forward for California, he also looked back at his own family history. When Brown was first sworn-in in 1975, he rarely talked about his ancestry. As the years mounted, however, he has increasingly turned to his family origin stories to illustrate his belief in California’s potential. Now the Brown family’s California Dream is a common trope in his rhetoric. He talks about the great-grandfather on the Perseverance, the grandmother who was the youngest of eight children, the father, Pat Brown, who preceded him in the governor’s office. Some of that reflection may be the natural consequence of age. But it also reveals a governor more assured of his own accomplishments and less fearful that he’s riding on his father’s coattails, said political scientist Sherry Bebitch Jeffe. A professor at University of Southern California, she’s been following Brown’s career since he ran for Los Angeles Community College board in 1969. The younger Brown first moved into the Governor’s Office less than a decade after his father had moved out. During those first two terms in office, Jeffe said, Brown went to great lengths to distinguish himself from his father. His early speeches reflect the schism. Brown—a 37-year-old bachelor at the time, famously sleeping on a mattress on the floor of an apartment—opened his inaugural address in 1975 with a quick quip about his dad. “My father thought I wasn’t going to make it,” to become governor, he said. “But here I am.” He went on to talk about problems with environmental and land-use rules, the need to provide a better system for funding schools and farmworker rights. For the next six years, Brown used his State of the State speeches to float ideas: developing more clean energy, building more prisons, making housing more affordable, putting a satellite into space, and overhauling the bail system. Then, as now, he acknowledged the uncertainty of the future and urged lawmakers not to spend too much. But by the end of his first two terms, Brown’s 1982 State of the State speech reminisced about his father, his grandmother and his great-grandfather Schuckman who traveled the plains from St. Louis to Sacramento during the Gold Rush. “Let me read to you from the diary that was kept during that trek westward,” Brown said then, recounted in detail their journey across deserts, through rivers and over mountains. He spoke of oxen dying of thirst and wagons going up in flames. Most people assumed, of course, that 1982 speech would be Brown’s final State of the State. But after serving as Democratic Party chair, Oakland mayor and attorney general, he reclaimed the governorship in 2010. In his inaugural address, Brown again read from Schuckman’s diary. “We can only imagine what it took for August Schuckman to leave his family and home and travel across the ocean to America and then across the country—often through dangerous and hostile territory—in a wagon train. But come he did, overcoming every obstacle,” Brown said. In 2015, Brown reflected on his father’s leadership in ways he never did in those speeches during his early years as governor. Now he’s planning retirement on the rural land in Colusa County where Schuckman settled in the 1800s. 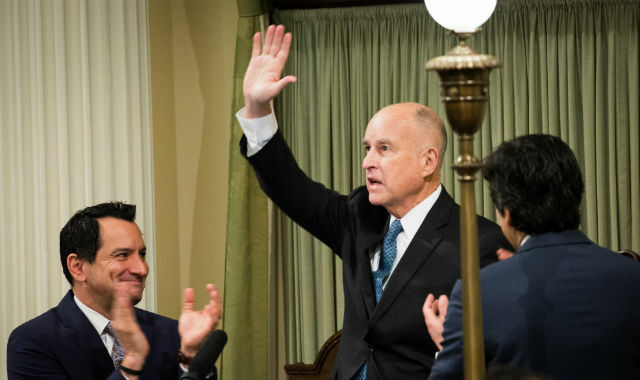 Though Brown’s upbringing is very different from most Californians, his family stories can make the austere governor more relatable, said Roger Salazar, a Democratic political consultant who works for the Legislature’s Latino Caucus.